Greetings, dear readers, and happy Monday! The weekend just flew by far too quickly, and I'm not sure that I am up for the week. My husband has headed out of town once again for a conference, and while I manage solo parenting pretty well on my own, my two year old has been really sick with a nasty stomach bug the past few days. Needless to say, I'm really hoping he gets over it quickly as it makes like far more complicated than usual! Now let's get into something much more lighthearted and nice to chat about, shall we? Now that I've caught up on a few things since last month's wildfires, let's get back to more beauty product from this summer's Cosmoprof North America. One of my stops included a visit with Spongellé, a company that sells body sponges that have been infused with body wash. While not a new-to-me brand, I had not yet seen their latest collection, inspired by the Zodiac. I was eager to check it out and see what else they might have in store for consumers. While the Zodiac itself is made of 12 signs, each of the signs are then categorized into one of four major elemental influences: water, fire, air, or earth. Rather than released 12 different scents for this collection, Spongellé instead has launched their Zodiac Collection based on the four elements. I am a Pisces and therefore a water sign and brought home a "Water" body wash infused buffer. The Water buffer is infused with a mix of water plant-scented body wash, and I love it! 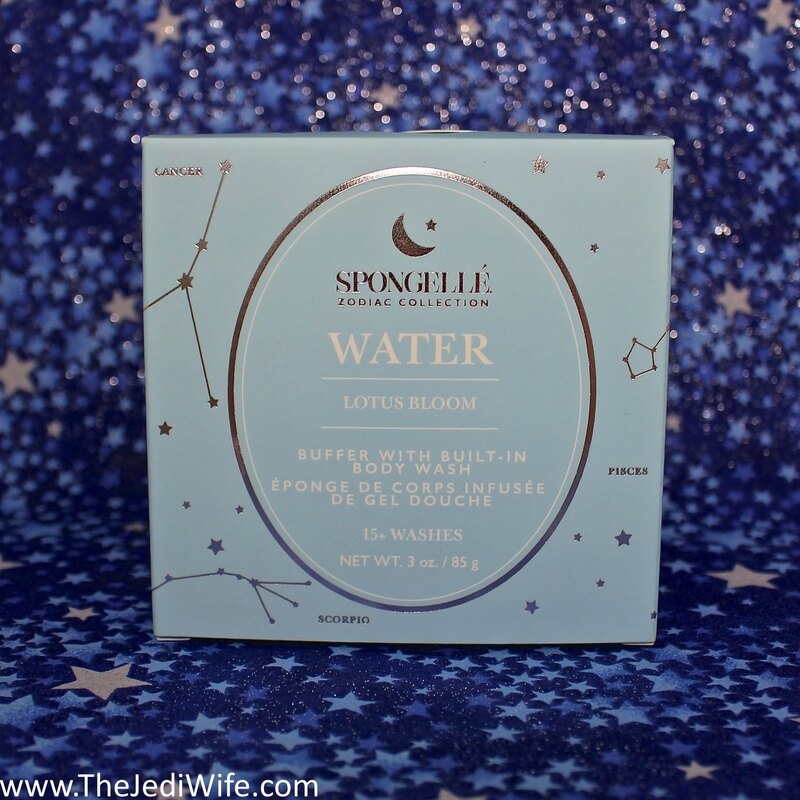 While I'm not crazy about most floral scents, I certainly have an affinity to water-type scents. As much as I enjoyed the fragrances of the other options (Spiced Neroli for Fire; Lavender and Sea Salt for Earth; Fresh Tuberose for Air), this Lotus Bloom variety was the one that won me over the most while I was smelling it at the show. The top notes are watery ozone and ocean greens. The middle notes are water lily and muguet bells before ending off with base notes of soft woods and soft musk. This body buffer works up to a rich and luxurious lather with just the addition of water. The body wash itself is included, after all! Because the body was is already infused into the sponge, you will need to wring it out and store it out of the path of your shower stream when not in use. This will help you get more uses out of your buffer rather than just rinsing the body wash down the drain! Spongellé guarantees 15+ uses with proper use, and I got just over 2 weeks of use myself with mine. The Spongellé body wash infused body buffers are made in the USA and are both vegan friendly and cruelty free. 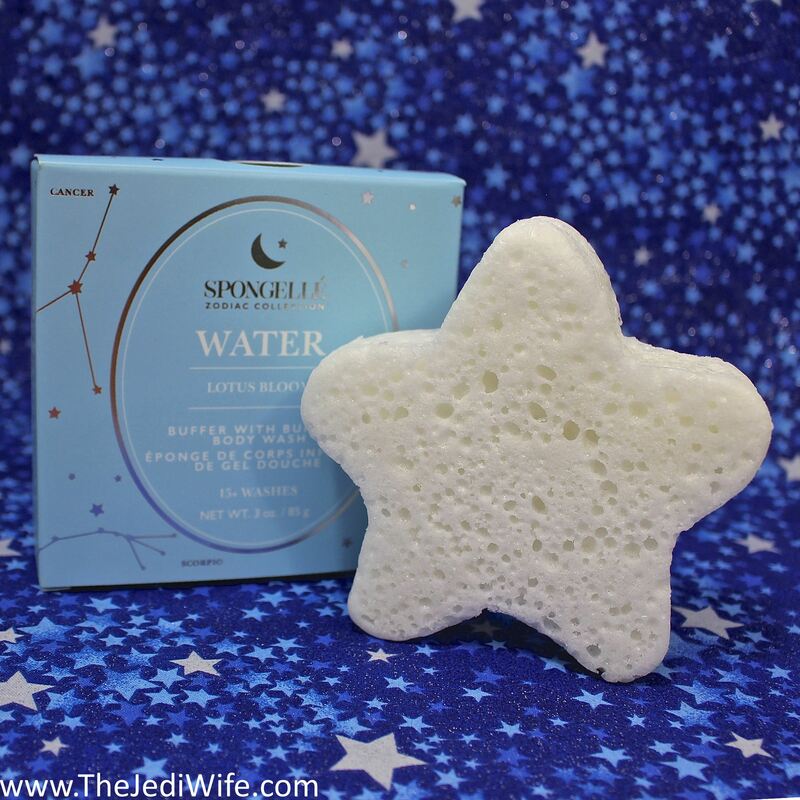 I was already a fan of Spongellé's other body wash infused buffers, and I am happy to report that the Lotus Bloom Water Zodiac Collection buffer is another winner! These sponges are the perfect size to fit in your hand comfortably, and I like that they remove the need to keep extra bottles of body washes in my shower. The smell is incredible, and the wash is luxury at its finest! I like the ease in portability, and I often take them with me on my travels. They also make excellent gifts for your friends that enjoy a little extra pampering without having to take any extra time out of their day. I have the website to Spongellé linked below, and I hope you check it out! It's a great place to get some holiday shopping done. 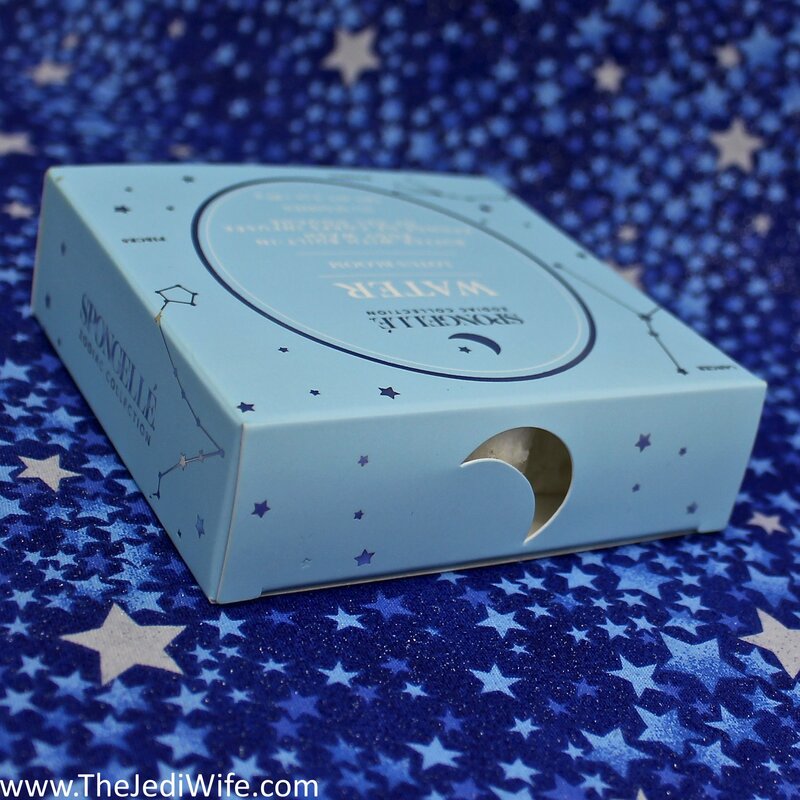 If you're not too sure about the Zodiac Collection in particular and need a suggestion, the Shimmer Collection is one of my favorites for the holiday season and the holiday ornament sponges are really cute! That being said, as long as you have a scent you or your giftee enjoys, you should be very happy with your purchase! 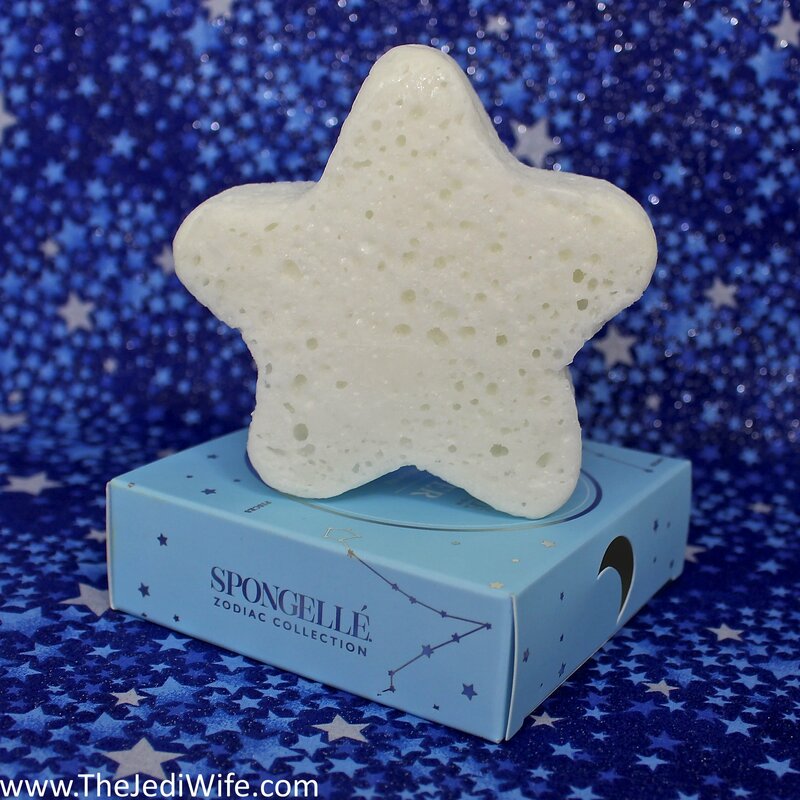 Are you familiar with Spongellé body wash infused body buffers? What types of scents are your favorites? I'd love to hear from you! I love light scents! I can’t handle those heavy and thick fragrances. Hope your kid gets better real soon! How much are these sponges? I like the idea of the infused product, definitely less clutter! Vegan AND cruelty free? Basically the perfect product! I am loving the idea! the sponge is so cute! I got a Spongelle just before Christmas last year and I loved it! With my pain issues it makes washing just a little bit easier and they smell amazing, total win win! I like the star shape, very Christmas-sy! This is the cutest! I would so give these out as Christmas gifts. I'll go check them out! I had a Spongelle once and loved the idea of it but the fragrance was so strong that I had to toss it after one use. This star one looks like a great gift though for the holidays. This sounds amazing! I've never heard of a body buffer, but it sounds like it's something that I'd love to have in my shower. What a fun Shape + packaging! Also I love the idea! This is definitely great idea for gifting! It's so cute! What a unique and great product! This would make such an awesome gift. Wow, 15 uses! That's really great! wow this is different. I would love this I am such a beauty product gal so thanks for this review. How fun are shower gel-infused bath sponges?? These would make great stocking stuffers! Oh, I got one of these in a box a while ago! I loved it! I have a couple Spongelle sponges in my bathroom cabinet waiting to be used. These are so nice! This seems like such a fun product - and would be a great gift! This sounds like a great product and I love that it is vegan as well. I would love to give one a try! I have a sponge similar to this and I love it! I bet this one is awesome too! I like the concept of relating the product with the 4 elements, gives me an earthy vibe. Spongelle’ is a nice product to try. That packaging is so cute! I've never used anything like this, but I would certainly be up for it. Such an interesting concept for a bath piece. Perfect for a holiday gift basket. This looks like a great product to try. If so, this will be the first for me. I love any fruity scent. I hope they have that too. This is my first time to learn about this. I love the design! So cool to have it while taking a bath. Lol! Anyway, I wish that your little angel will be well the soonest. That is a really cute sponge. And it sounds convenient in size and with the soap already loaded. I agree it would make a good gift. I love how alive a body buffer makes me skin feel. I love that this one is so cute. I'm not familiar with these, but I must say that the Lavender and Sea Salt sounds nice. Such a fun product! You reminded me that I have one of these in my skincare to-try pile! I need to pull it out. It seemed so interesting when I got it! I've never heard of this product or even the idea. I'm a Capricorn and I'm wondering what the Earth scents are like.